Bright House Networks customers could face much higher cable television bills and a decline in technology upgrades thanks to a merger deal between two companies that should theoretically have no impact on them. Bright House Networks has been an odd duck among cable companies since it was created from cobbled-together systems originally owned by Vision Cable, Cable Vision, TelePrompTer, Group W, Paragon and others. In the 1990s and early 2000s, Time Warner effectively ran the cable systems still owned by the Newhouse family. After the AOL-Time Warner merger, Advance/Newhouse decided to take back control of the management and operations of its cable systems, relaunching them under the Bright House Networks brand. While the Newhouse family continues to assert its ownership and control of Bright House, it is highly dependent on Time Warner Cable to handle cable programming negotiations and broadband technology. That is why Bright House customers were sold “Road Runner” broadband service for many years – a brand familiar to any Time Warner customer. To this day, programming blackouts that affect Time Warner cable TV viewers usually also impact those subscribing to Bright House. Time Warner Cable also retains a minority ownership interest in Bright House. Although the company is well-known in Indianapolis, Birmingham, suburban Detroit and Bakersfield, its presence is most recognized in central Florida, where it serves customers in Orlando, Daytona Beach, Lakeland, Tampa Bay, and many points in-between. Despite the fact Bright House serves more than two million customers and is the sixth largest cable company in the country, it is small potatoes to major programmers like Comcast-NBCUniversal, Viacom, Disney, and others. All the best discounts go to satellite television providers and giant cable operators like Comcast and Time Warner Cable. Smaller operators pay substantially more. 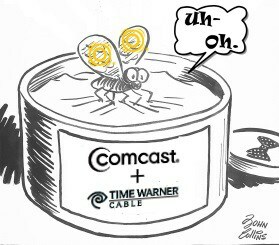 That is where the merger between Comcast and Time Warner Cable comes in. The federal government is likely to count Bright House’s 2.2 million customers as part of the Time Warner Cable family, at least as far as control of cable programming pricing is concerned. Despite Comcast’s voluntary commitment to keep its national share of the cable TV business under 30 percent with the merger of Time Warner, Comcast hasn’t taken seriously counting the customers of the uninvited cousin – Bright House. Logistically and legally, Comcast would assume control of Time Warner Cable’s interest in Bright House if the merger is approved by state and federal regulators. That may be too much for regulators to swallow. The Newhouse family has evidently seen the writing on the wall, hiring Wall Street investment bank UBS to advise whether it makes sense to sell. If Bright House does decide to hang out a “for sale” sign, Time Warner Cable has the right to bid first. But by that time, if things go according to plan, it might be Comcast ultimately swallowing up yet another large cable system. The need for competitive pricing in the marketplace is very apparent.